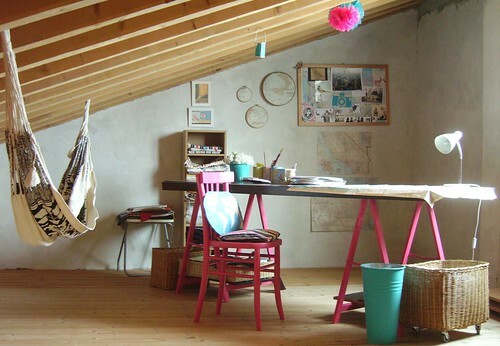 I find myself clicking “a fave” every time I see a great work space on Flickr; somehow no matter how hard I try, I cannot get mine to look as nice as the likes of this desk area, from flickr member and blogger The Style Observatory. 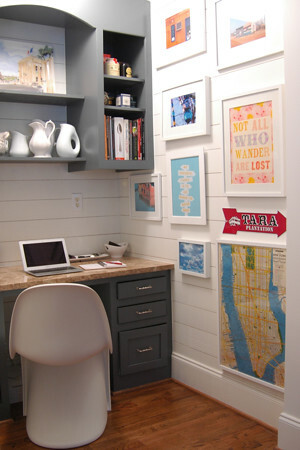 Love the nautical charts, love the inspiration board, the flowers and the thought of plugging in my laptop in this spot. How’s your workspace? Share it with us in our Fresh New Spaces group. Well, January’s quite over, the Superbowl is over, and it may be time to get back into those weekend projects. One part of making your home office a place where you want to spend time is to be sure and add artwork that inspires you. Whether it’s nautical charts, a big inspiration board, etsy prints or a vintage blackboard, why don’t you get out a hammer and nails and get cracking on this one? It won’t take long but it will make a big difference! Today it’s my pleasure to welcome back Lisa Adams, C.E.O. of L.A. Closet Design to help us all with some expert home office organization tips. Take it away Lisa! Work Zones: Start by thoroughly and honestly evaluating your work and your workspace. The efficient office should be zoned into activity areas such as “the work area,” “the supply area,” “the reference area,” “reading area,” etc., which should be named and prioritized by how you conduct your work. For example, “the work area” might include a clear workspace, a computer, and frequently used office supplies; whereas, “the reference area” might include binders, manuals, dictionaries, and professional books and materials. Everything should have a place and everything should be in its place. Once the zones have been defined, position the zones by frequency of use. If supplies are used daily, they should be within easy reach of your work area. This zoning process all depends on the function and your daily work habits in your office, so evaluate and design a proper plan. Separation of Space: When working from home, it is important to maintain a separate workplace within your home—to set boundaries and protect it from the rest of the home. Make it a rule to only use your home office for the purposes of business, not for storing household items or entertaining guests. If you do work from home and do not have a separate room for an office available, use devices such as screens, bookcases and directed lighting to create the necessary separation between home and office. Minimize Equipment & Paper: Efficient offices have one thing in common—uncluttered work tops. To maintain a clear work station, try to minimize your office equipment such as printers, fax, phone, filing and paper. If possible, purchase an “all-in-one” printer that encompasses a fax and scanner to consolidate equipment space. Additionally, papers and other documents can be stored electronically either by using a service, or by copying files to DVDs or CD-ROMs. This will help to reduce the amount of filing space needed for paperwork that should be saved, but is not needed on a regular basis. Stay on Top of Business Tasks: Handling responsibilities and tasks as they occur throughout the day is key to home office organization. Paperwork should be scanned or filed immediately instead of being left in a pile on your desk. Email and mail should be read and acted upon the first time received. It is unnecessary to read an email and decide how to respond to it later. Read emails once and take an action: save, delete, or respond. 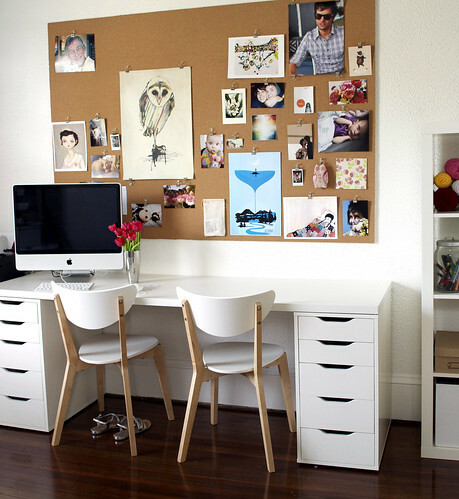 This will not only minimize clutter, but it will also greatly increase productivity. If all of the recommended tips are followed and maintained, your home office will become more organized and clutter-free. Weekly checks should be enforced to make sure there are no extra papers on the desk or other unnecessary items left abandoned. Every item should be put in its proper place as soon as its purpose has been served.